The “Future Day” hoax currently making the rounds can be confusing in that it isn’t an actual hoax, but rather appears to be a case of information slippage from a nearby timeline. In this present timeline (Q42), the date Marty McFly travels forward to is October 21, 2015. 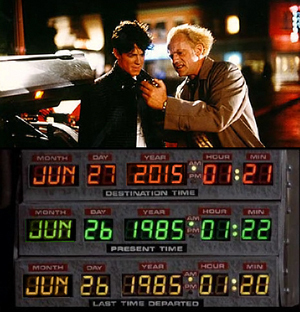 However, in the timeline in which Eric Stotlz played Marty McFly, (Q41) the date is June 27th 2015. Exactly how the date slipped into this present is unknown, but occasionally Chinese bootlegs from alternate timelines do manage to make there way here. How the year was changed to 2012, however, is probably a matter of impatience and the unrealistic expectation that Mattel will soon be releasing a Hoverboard. That Hoverboard is never coming. This may be disappointing, but for those of you who dwell only in this timeline, however, you can look forward to seeing a good 20 minutes of Eric Stoltz footage on the 2015 Blu-Ray re-release, which is great fun and not unlike visiting an alternate history.